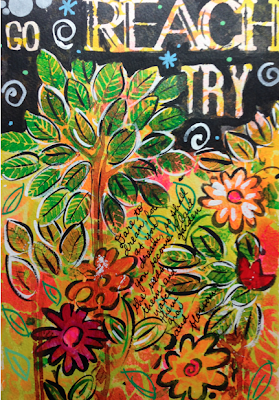 Jessica Sporn here with an art journal page I made using four of the newest stencils from Stencil Girl. 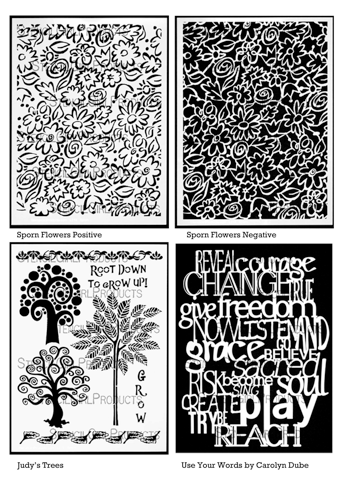 They are Sporn Flowers Positive, Sporn Flowers Negative (gee – I wonder who designed those? 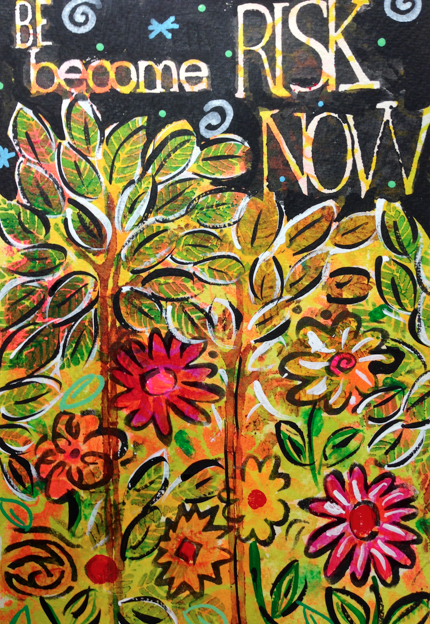 ), Judy’s Trees (gee, I wonder who inspired that stencil?) and Carolyn Dube’s “Use Your Words” stencil. I designed the two flowers stencils so that they can be used together. But they can also be used separately. I used the Negative flowers to create outlines of flowers, which I then painted with a mixture of acrylic paint and glazing medium. I added the trees, and then doodled with a thin paintbrush and black and white paint. I used some of Carolyn’s words on the top. I love how the background layer of the positive flowers shows through the open spaces created by the letters. This was inspired by one of Carolyn’s posts. 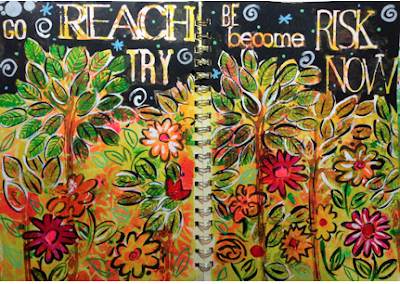 I added some more doodles with my Posca markers, and some journaling with my Scarlet Lime pen. It’s so important to remember that stencils are just tools. Make them your own. Doodle over them or inside of them. In the end, it will hardly look like you used a stencil! Thanks for reading! 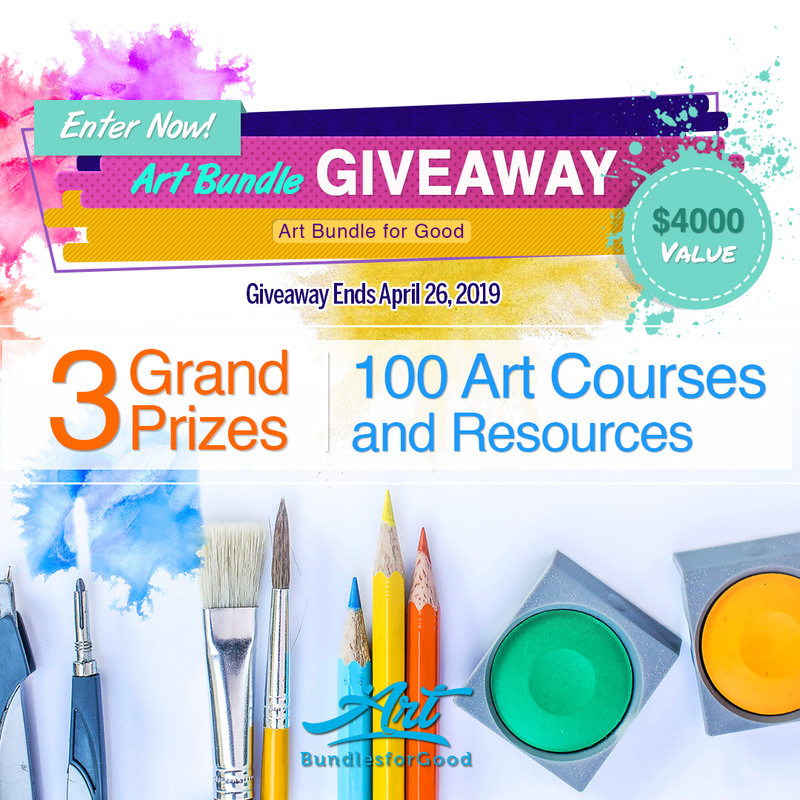 Hop on over to my blog to leave a comment. 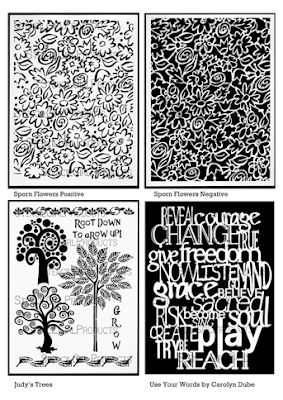 One commenter will win all three of my new stencils: Judy’s Trees, Flowers Positive, and Flowers Negative! Flowers and trees a great combo! This is one of my favorite pages, Jessica. Those flowers.. wow. I just get my hands on them. I love the black background. Pops with the colors below. Wow, this turned out so cool. You are right, it doesn't look like stencils, truly original. Love. I have been playing with the words stencil a lot. I was looking at the positive and negative flowers too. I am so glad i can follow, what was I waiting for? WOW, such wonderful pages! I love the contrast between the black background and the vibrant colours! Great pages and video!!! It was so fun to watch you create... thanks for sharing!